What's better than free? Nothing. If you are tired of managing your holiday schedule in 3CX, let us help! Configuring the holiday schedule in 3CX is a tedious task that too often gets pushed off to another day. That's why we created 3CX Holiday Importer -- to make your life just a little easier. Everybody knows there is always one task that never gets done on almost every 3CX install — entering the holiday schedule. But now it’s so easy, there’s no excuse for not configuring holidays. With this FREE tool from VoIPTools, you can select National and Religious holidays from countries all around the world and import them directly into 3CX! 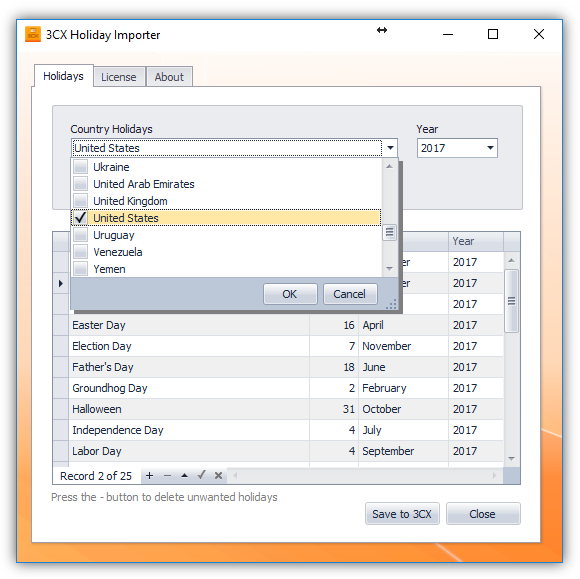 And because 3CX Holiday Importer enables you to import holidays through the year 2029, this may be the last time you have to touch the holiday schedule. Where should I install 3CX Holiday Importer? You can install it directly on your 3CX server, or on a separate PC. But you do have to install the VoIPTools Relay directly on the 3CX server. What is the 3CX Relay, and why do I need it? All VoIPTools products communicate with 3CX through the VoIPTools Relay. The Relay makes it possible for 3CX Holiday Importer to update the holiday schedule in 3CX. Does the VoIPTools Relay have to be installed on the 3CX server? Come on, is 3CX Holiday really free? Absolutely! It is completely free, never expires, and has no limitations. It's our way of saying "thank you" to our 3CX customers. If I upgrade 3CX to a newer version, do I need to update 3CX Holiday Importer? Will 3CX Holiday Importer work with the Linux version of 3CX? No. For now, our VoIPTools Relay only works with the Windows version of 3CX, and the Relay is required to successfully install Holiday Importer.